Adding to its collection of homes in two of its destination clubs. 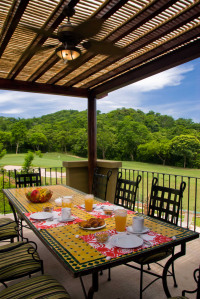 Ultimate Escapes has added a villa and a condo at Reserva Conchal in Costa Rica. Located on the North Pacific Coast of Costa Rica in the Guanacaste Region, Reserva Conchal is a beach resort and a master planned community of 2,300 acres. It is designed to combine luxury living with nature preservation, that will include preserving 700 acres of forest corridor and 95 acres of bio-sensitive mangroves. The 4,700 sq ft villa is part of Ultimate Escapes Signature Club and provides 4 bedrooms, 4 and 2-half bathrooms and a private outdoor pool. The 2,515 sq ft condo is part of Ultimate Escapes Premiere Club and provides 3 bedrooms, 3 and a half bathrooms and views that stretch over the greens to the Pacific Ocean. Costa Rica is becoming increasingly popular with the destination clubs. High Country Club recently added a 3 bedroom condo, also at Reserva Conchal. Lusso is developing four ocean front residences at La Punta Papagayo. Last year Exclusive Resorts opened its own mini-resort at Peninsula Papagayo with 21 four bedroom residences. Direct flights into Liberia airport are available from Atlanta, Charlotte, Chicago, Dallas, Houston, Miami, Newark and Toronto. The drive to Papagayo or Reserva Conchal then takes about 30 - 45 minutes.